Learn how to save credit cards and addresses and fill them in your browser, like when you’re shopping online. 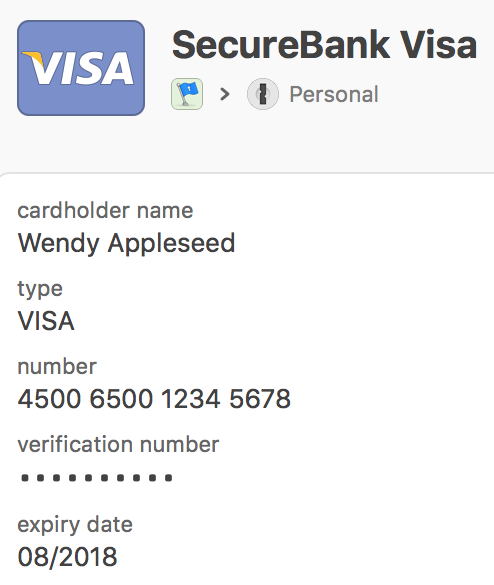 In addition to filling passwords, 1Password also fills credit cards and addresses. Before you can use 1Password in your browser, make sure you’ve set up the 1Password app. 1Password is installed in your browser. 1Password is not installed in your browser. Install it now. Before you can fill a credit card or address, you’ll need to save it in 1Password. Click then select Credit Card or Identity (to save an address). Enter all the information you want 1Password to fill for you, then click Save. Click the 1Password button in your browser. Click Credit Card or Identity, then select the one you want to fill. 1Password will fill the information on the page.